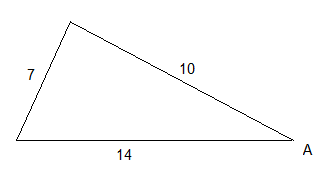 The cosine rule is used to find unknown lengths or angles in triangles. 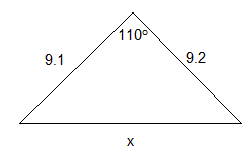 It is particularly useful in non right-angled triangles, and when two sides and a given angle are given, or three sides with the objective of finding an angle. The capital letters denote the interior angle at that point. In other words, B is the angle ABC, and A is the angle BAC. The lower-case letters are the lengths of the side opposite to the corresponding angle. That means that a, in this case is opposite to A and represents the length BC.